Viola is back home from boarding school and she's got her summer ahead of her in Brooklyn. She'll be reunited with her best friends Andrew and Caitlin and can't wait to spend a fun summer together. However, Andrew has been acting a bit strange around Viola and unfortunately, is going away to summer camp. Caitlin is constantly ditching her to be with her new British boyfriend that she met through Viola and asking her to cover up for her when she's lying to her parents. When Viola's friends from school come to visit, she is starting to wonder if she should even stay in Brooklyn as planned! Thankfully, she has a summer internship and her documentary to keep her busy. 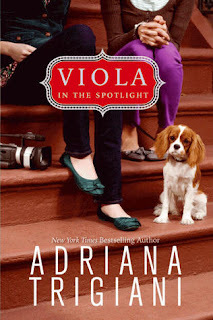 Adriana Trigiani's Viola in the Spotlight is a delightful tale of growing up and navigating through many of life's twists and turns. Whenever I read a Trigiani novel, I am always so happy to see her emphasis on family and friends. Readers can rest assured that it's the same in her young adult novels as well. Viola is close with her parents and her grandmother, too. I love that aspect of the book, because you don't find it too often in YA literature. Character-wise, Viola is charming, fun-loving, strong and a good friend. I love that she has dreams and aspirations at such a young age and of course, as a teacher, you love to see that in YA books. But this aspect of the book wasn't overdone; it was definitely believable, which I appreciated. Also, in true Trigiani fashion, there's quick and witty dialogue which had me on my toes and laughing out loud. Fans of Trigiani's adult books won't be disappointed with the characters or dialogue. I also loved that this book can easily be put in my classroom library, in fact, when school starts back up, that's where it's going. I cannot wait to recommend this book to my female middle school students and I think it's going to be a big hit. I haven't read the first book in the series, Viola in Reel Life, but I like that these books can stand alone if need be, which makes it perfect for my classroom library. My only disappointment with this book was the conflict. I felt at times it was a bit predictable and lacked suspense, but then I remembered that this is for young adults. Viola in the Spotlight is perfect for young adults as it touches on many of the issues that they deal with daily, such as friendships changing and of course, new relationships. It doesn't always have to be this life altering cliffhanger that I've grown accustomed to with most fantasy series. All in all, if you are looking for a charming contemporary read that will warm your heart and have you laughing out loud, Viola is your girl! And thanks to Lauren at Authors on the Web and HarperTeen, I have a brand new hardback copy to giveaway to one US/Canadian reader. Please refer to my giveaway rules, be sure to enter by July 8th, and please remember to fill in the form below in order to officially enter. Meanwhile, Viola in the Spotlight will be waiting for its grand entrance to my classroom library. Great review! I love books that can make me laugh out loud and am always look for good contemp reads! I haven't heard of this series before, but they sound like fun reads! I like that there's such a strong emphasis on family, you're so right that that's shockingly uncommon in YA lit. Awesome review Christina! I have both books in this series to read soon. They sound cute! Love the review. This sounds like a great read and I think the cover is cute. I really need to read an Adriana Trigiani book soon. I have been curious about this series as well as her Valentine series. Thanks for sharing your review of Viola in the Spotlight. I remember planning to read Viola in Reel Life when it was published but I never got around to it. Thanks for your review!